Old and wrinkled, Charlie is a man well beyond the best years of his life. He is the elder statesman aboard the Washington and he looks it and acts the part. He has pale white skin, still has a full head fof grey hair, and for the most part is exactly the way you'd expect an elderly gentleman to be: elderly. An overly theatrical man, very shakespearian in how he speaks and acts. He is a nice man, but is not very fond of young people, from whom he demands a great amount of respect. He is the elder statesman aboard and like to be treated as though that distinction meant he were more important. He is helpful, but does not go out of his way to do things. He follows orders, takes no risk, and is aboard to get a little more action into his life. Shakespeare, Theatre, Opera, Music, Literature, Poems, Art, Bolwing, Criquet, Scotch. Born in 2321, Charlie has lived a long an successful life thus far. He went to King's College for 6 years and became a High School Literature teacher for 16 years. He was very involved with the school's drama clubs and was an active proponent of teaching Shakespeare. He married Maggie Elizabeth in 2347 and had 5 children with her: Jonathan, Virginia, Irene, Nelson, and Charlie Jr. Their marraige lasted for 24 years until Maggie died of heart failure in 2370. He quit his job as an educator and took a year off to soul search. 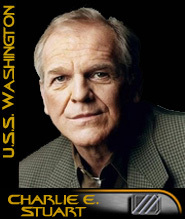 In 2372 he enrolled in Starfleet Academy and graduated as an enlisted officer the following year. he was interested in getting some thrills into his life after 50 years of no thrills what so ever. He served aboard the Starships Berlin and Varden Hurk and was promoted to his current rank of crewman. He is now serving aboard the USS Washington as the 2nd Tactical Officer and elder statesman of the vessel.